This event celebrates the thousand-year-old Lithuanian Jewish heritage through visual arts and music. Aviad Sajevitch, an exceptionally talented and recognized visual artist in Israel, has prepared a special artwork exhibition representing the world of his forefathers in Lithuania. Each painting opens a window into the rich history and culture of the Lithuanian Jews. 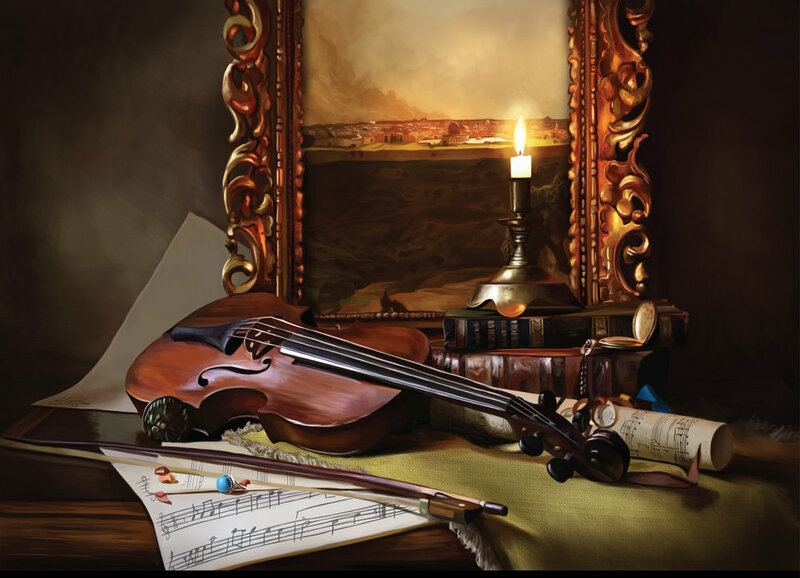 In addition to this visual exhibition, the musicians of the Sayevich family will unite with musicians in the Kansas City area to present musical works that represent the Jewish heritage. The program will include well-known Yiddish songs that have been long beloved by people of the eastern European Jewish ethnos. Classical works of a similar theme will also be performed, as well as original works by Schmuel Sajevitch composed especially for this event. We hope you will join us to commemorate and celebrate such an important cultural heritage. Aviad Sajevitch was born in Israel in 1989. He started sketching and painting from an early age and developed his techniques alone through practice at his own free time. At the age of 16, music came into his life and he started to sing. In 2007, he graduated high school after expending art major. later this year he got drafted to the IDF. From 2007 - 2010, he served in the Israeli navy as the lead singer of the Israeli navy ensemble. While serving in the army, he performed all over Israel. In 2009, as a singer in the Israeli navy ensemble, he performed before Jewish communities in Argentina, Panama and the US. Although he occupied himself with music, he never forgot his love and desire for painting. through the years he researched and studied his favorite artists (Bouguereau, Da Vinci, Caravaggio) and kept improving his technique. After finishing his service, Sajevitch kept singing and performing all over Israel. in 2013 he took part in the Israeli television show: “A Star Is Born”. Later that year, after taking multiple exams, he was accepted to study visual communication at Bezalel university in Jerusalem and at Shenkar college of engineering design and art. Between the third and fourth year of his academic studies at Shenkar college of engineering design and art, he presented his artwork in a new bar in the middle of Manhattan. This project shined in the Israeli Media. While studying there, he expanded Illustration major and Led by leading lecturers in the field, he graduated his academic studies in the summer of 2017. His final project, called “The Celebrities’ Living Room”, was most appreciated by the Israeli media. from that moment, Sajevitch and his paintings took part in several TV shows, a lot of newspapers and magazines and of course art galleries. right away he started to receive work in the field. He paints portraits with his unique style, he illustrates album covers and children books. As a freelance illustrator he started to illustrate almost every week for known Israeli magazines such as Globes.